Early Indian Village and French trading post 1749. First white settlement in Western Reserve—Jean Baptise Flemmond 1790 Surveyed 1806 by Almon Ruggles. Site of first school in Firelands area in 1810—Alvin Coe and Jamar Ruggles, teachers. Base of Huron Rangers, protecting settlers during War of 1812. Captain Joshua Cottom, commander. Rangers fought bloody battle on Peninsula to repulse Potawatami invasion of Johnson’s Island. 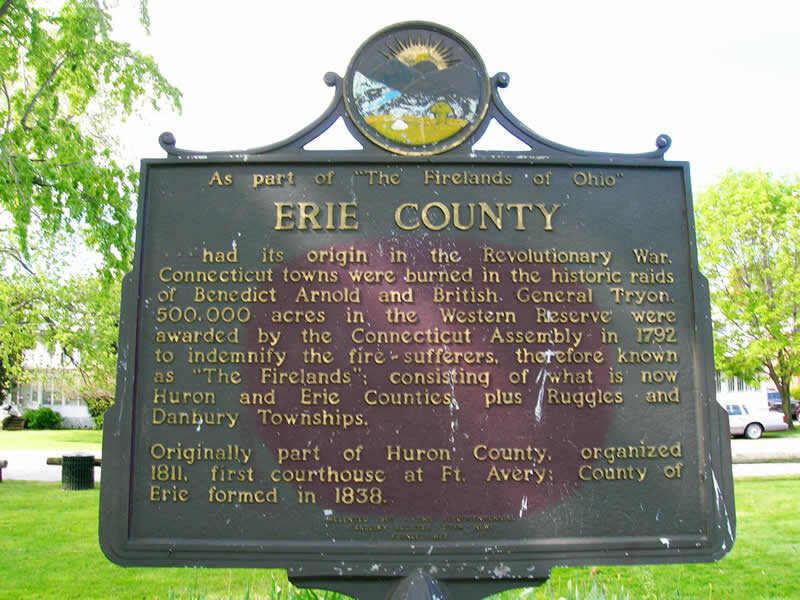 Text: Side B Erie County—had its origin in the Revolutionary War. Connecticut towns were burned in the historic raids of Benedict Arnold and British General Tyron. 500,000 acres were awarded by the Connecticut Assembly in 1792 to indemnify the fire-sufferers, therefore know as “The Firelands”: consisting of what is now Huron and Erie Counties, plus Ruggles and Danbury Townships, Originally part of Huron County, organized 1811, first courthouse at Fort Avery: County of Erie formed in 1838.